Alexandra Bee Blog: Foxfield Weekend! I've decided to put my 1st of the month Africa post on hold a day to share my weekend with you! It was a fun weekend for sure, but now it's definitely crunch time. In the next 8 days I have a paper and 3 group projects due, 3 exams, and my Student Teaching Orientation. I will still post every day this week and do my best to read your blogs when I take study breaks, but if my commenting is less than usual, don't take it personally. Friday night I headed to Final Fridays at the UVA Art Museum with my resident, MTE. It was so fun, there was a live band, beer and wine, and lots of hors d'oeuvres all free for students. We perused the art (the current exhibits were: Southern Views/Southern Photographers, Andy Warhol's Society Portraits, and Excavating New Ground (American Art in the 1970s)) and enjoyed feeling "cultured". Afterwards, another resident, CES, joined us, and we headed to The Backyard for dinner and to check out the Vineyard Vines Spring Tour. I got a koozie and new whale sticker! 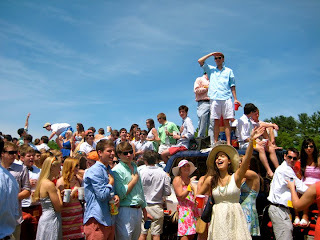 Foxfield on Saturday was by far my favorite of all 4 years. The weather was perfect in the 70s with sunshine, a nice breeze, and no humidity. I had planned to maybe make a bet or two using Main Line Sportsman's tips, but in the fun of the day I never got around to it! We mixed with Sigma Chi this year and as usual it was quite the day of celebration by UVA students! The dress I wore was the Lilly Whit Shift in Skye Blue Exbloomsion. I saw the dress online over Spring Break and knew I had to have it. The ladies at The Pink Palm were so helpful. They were completely sold out of the dress in Cville, but they called all the other stores to track it down. There was only one left in my size and it was on hold. They put a second hold on the dress for me and we crossed our fingers. 3 days later I got a call saying the dress was in, I tried it on and LOVED it! I paired it with a white floppy hat. I must note that the hat was tough to see in, so I spun it around to make walking/seeing easier. Don't judge the goofy look! My friend REN was decked out! One funny tidbit I thought y'all would like to hear is that I now have a thick tanline on my forearm from where my bangles rested most of the day while carrying my purse! Also...can you believe it-- Osama Bin Laden is DEAD! Don't forget to check out my first giveaway here! love your dress!! i was so excited for the whit shift but it was wayyyy too short for me! Aren't the Lilly ladies wonderful?? They were so helpful to me as well in tracking down a dress. And I adore your hat- wish I could pull off that look! Good luck on exams! Your Lilly dress is so so cute!! I don't envy you all the work you have to do for finals...but hey, the finish line is in sight!!! I truly can't believe that Bin Ladin is dead and I am just so happy for all the families that can have a little bit of peace and closure knowing that crazy murderer is *gone*. Thank heavens for that. P.S. on a lighter note...love me a man in a bow tie!!! Looks like an awesome event! You look super cute and it looks like you had a lot of fun! Good luck with your busy week!! you are presh in your Lilly! Looks like a fun weekend! Love your Lilly dress! 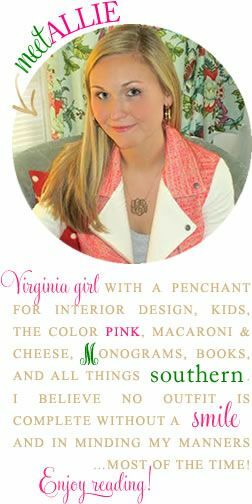 You are soo cute, the quintessential picture of a pretty, refined southern young lady! Love it! Hope you had fun...your dress and hat are darling. Looks like a great day...good luck on your exams. Looks like the perfect weekend. Love the Lilly dress. You rocked it! Cute hat!! And I would just LOVE being at this foxfield race. The outfits are SO cute, I wish boys dressed like that here. It looks like a grand old time. And OF COURSE we will cook together, hang out, shop, discuss teaching/lesson plans all the time if you go to Houston for TFA!! I am keeping my fingers crossed. Where are your top choices? I am in the middle of interviewing at an ALL BOYS school right now actually so I hope I get that placement because it looks like an inspiring, life-changing place. What a fun event to have at the museum. I thoroughly approve. Very cute outfit as well. What a fun weekend!! I love all of the pastels in that picture of the UVA students all celebrating :) It looks like so much fun! Your weekend looked super fun! I recently went to the polo club ini Hong Kong and it was great! people don't dress up in awesome hats but it was still awesome. Sounds like a fun time at Foxfield! The weather was perfect for it! What a FUN weekend!!! Love your outfit (and hat) for the races. And, how fun that Vineyard Vines tour must have been. That patchwork truck is too much!!! Thanks so much for stopping by in the midst of all you have going on! Good luck on exams! Can't believe O.B.L. is gone. Crazy. Also.. your weekend looks like perfection. Sounds like a fun weekend. I love Vineyard Vines's SUV. It looks like you had a fabulous time at Foxfield! My plot was right near the horses, so I'm sure we crossed paths at least once! Good luck with all of your work this week! Love your cute dress and floppy hat! So chic...looked like a great weekend! I so miss the lazy last days of 4th year. We all met up at a bar the morning of graduation, which I think is a tradition...are you going to do that? Only once in a lifetime! always wanted to go to this! looks like so much fun- you look gorgeous! Aw I was so sad to miss Foxfield this year!! It looks like you had tons of fun (of course, it's Foxfield)! You look great! I was there too, and I'm still suffering from a sunburn on my shoulders. 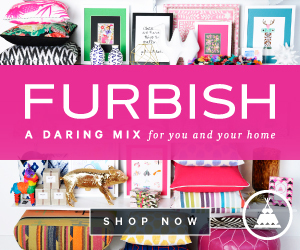 Just found your blog and am a new follower! !